Travel theme: Decoration | Where's my backpack? After my trip through Leavenworth‘s year round Christmas shop my thoughts are filled with all things decorative so I went looking through my photos to see what other embellished delights I could lay my hands on. Bright red eggs make a pretty centrepiece for a traditional Greek Easter celebration. They also provide the ingredients for a great after-dinner game. Beautifully ornate Turkish pottery that I would have bought if it weren’t for the fact I had only an overstuffed backpack and it would have smashed for sure. Those colours just make me happy. Manhattan’s Upper West Side doesn’t pull any decorative punches on Hallowe’en; this dreadful creature was so lifelike it made the hairs on the back of my neck stand up in terror. This entry was posted in Photography, Travel, Weekly Travel Themes and tagged inspiration, photography, photos, travel, weekly photo challenge. Bookmark the permalink. The Turkish pottery is beautiful and would be a wonderful adornment to any home. I love the Turkish pottery, beautiful!! The last one is scary. Haha, yes, Amy, that last one terrified me, I thought it was a real person in costume when I first saw it. Gave me the heebie jeebies for sure. 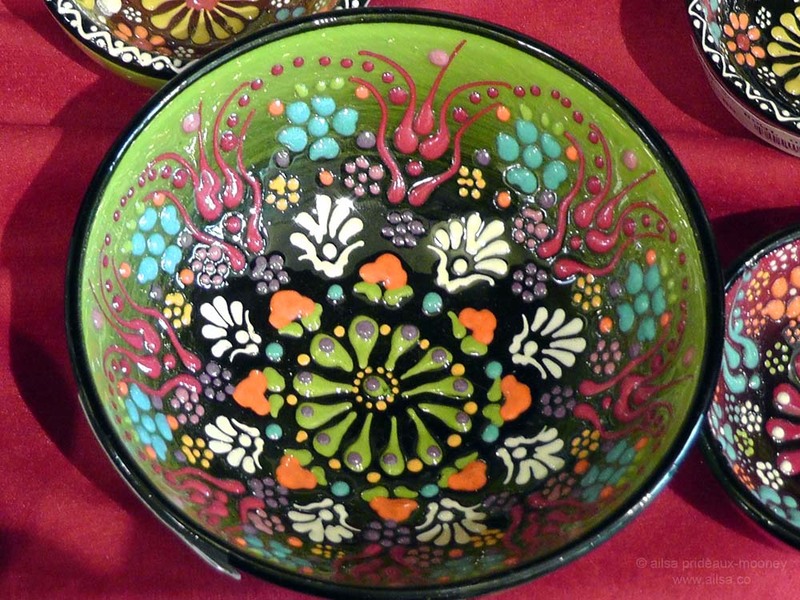 Those patterns of Turkish pottery are really beautiful, Ailsa! Pingback: Travel theme: Decoration | So where's the snow? ‘Decoration’ got me thinking of the carving on Celtic crosses, which in turn got me reminiscing about my visit to Glencolumbkille in County Donegal, back in 2002. Thanks for this week’s theme which has taken me back to my fantastic holiday with Mum in 2007. This is a wide theme, Ailsa. Here’s my take: http://wp.me/p16tta-zq. I’m loving this week’s posts but for some reason my “like” option has disappeared from my computer. Sorry if I haven’t liked yours. Really I do like it. And if you can tell me why I can’t and how to fix it I’d be most grateful. Oh wow, he’s gorgeous with his long twirly horns, what a beauty! Pingback: Decoration… Ailsa’s WTT | Ouch!! My back hurts! !